Governor Andrew M. Cuomo, Governor Ricardo Rosselló and members of the New York Congressional Delegation today called on the federal government to immediately approve a $94.4 billion federal aid package to rebuild a stronger, more resilient Puerto Rico. Building on the efforts of New York State to help Puerto Rico rebuild after Hurricanes Irma and Maria, New York officials and business and nonprofit leaders conducted an assessment of the damage and identified specific funding recommendations to rebuild a stronger, more resilient Puerto Rico. "Puerto Ricans are American citizens who deserve support and compassion when faced with disaster, and this federal funding is imperative to ensuring that the island builds back better than ever before," Governor Cuomo said. "We urge Congress to stop delaying this important request, take responsibility and immediately approve this critical funding." "With the help of New York and other partners, we are on the road to recovery after Hurricanes Maria and Irma, but there is still a monumental amount of work to be done to rebuild Puerto Rico," Governor Rosselló said. "We are calling on Congress to recognize the people of Puerto Rico as equal citizens of the United States and take action to give us the help we desperately need. I thank Governor Cuomo and the New York delegation for their partnership in our advocacy and for all of their work to help the people of Puerto Rico." The report's findings indicate that more than 472,000 housing units were destroyed and severely impacted, hundreds of thousands of Puerto Ricans have left to seek refuge in shelters or homes of family and friends, the agricultural sector was nearly totally destroyed, including the loss of almost 80 percent of planted crops and nearly all of the water and wastewater were rendered inoperable. The breadth and depth of this devastation presents an opportunity to "begin again" and rethink the design of major components of the island's infrastructure, invest in the quality and resiliency of its housing and public buildings and modernize how basic services are delivered to residents. Within these areas, the plan identifies sectoral impacts with specific and strategic investments to rebuild stronger and better. The full report is available here. "We urge Congress to stop delaying this important request, take responsibility and immediately approve this critical funding." Together with $487 million for public safety and first response and $9 billion for long-term recovery management, the total funding need is $94.4 billion. Congresswoman Louise Slaughter said, "Puerto Rico is a part of our country and it is home to more than three million American citizens. The mayor of San Juan had a simple request since the start of the devastation: 'Do not forget us and do not let us feel alone.' We have an obligation to help our citizens during what will be a longer than anticipated period of rebuilding." Congressman Eliot Engel said, "For months, we in the New York Congressional Delegation have called on our colleagues in Washington to help us do more for Puerto Rico. The devastation our fellow citizens endured there was catastrophic, and additional aid is not only necessary, but critical in order for the island to make a full recovery. I am proud to join Governor Cuomo, Governor Rosselló, and my Congressional colleagues today in standing up for Puerto Rico, and urge Congressional leadership to take up this aid package immediately." Congresswoman Nita M. Lowey said, "New Yorkers—who vividly remember the destruction of Superstorm Sandy—know how difficult it can be to recover from catastrophe, and that as Americans we have a responsibility to help out those in need. As the senior Democrat on the House Appropriations Committee, I traveled to Puerto Rico after Hurricane Maria to see the damage first hand, and I am helping to negotiate and write disaster assistance to the island. Thousands of Puerto Ricans are still without power and access to clean drinking water, and the Administration's response is insufficient. President Trump's supplemental funding request, which is based on the premise that conditions in Puerto Rico are so bad that they will have to wait for recovery resources until next year when damage assessments are completed, is outrageous and neglectful. Puerto Ricans are American citizens. We must ensure that Puerto Ricans not only have access to food, shelter, and electricity, but that we help them build back their communities so that they can get back to their normal lives." Congressman José E. Serrano said, "We need comprehensive funding to help Puerto Rico fully recover from the devastation of Hurricane Maria. As one of the few Members of Congress born on the island, I am proud to join my New York colleagues in working to ensure that the island can rebuilt and thrive going forward- and to hold the Administration accountable to the needs of all American citizens, regardless of where they live. 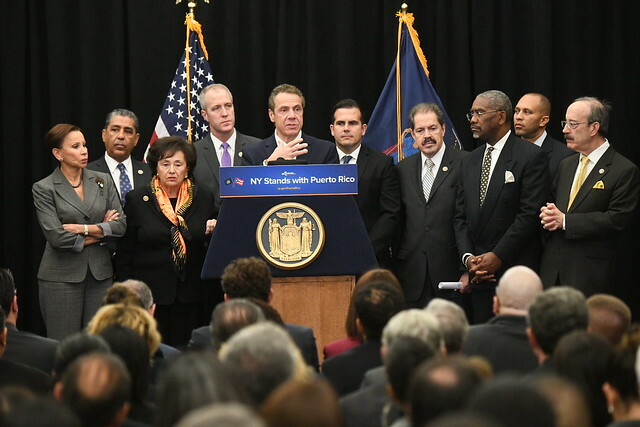 I thank Governor Cuomo for helping lead these efforts, because New York has a vital role to play in this process as the place that so many Puerto Ricans have made home over the years." Congresswoman Carolyn B. Maloney said, "This emergency aid is long overdue and vital for Puerto Rico's recovery. It should be an embarrassment that these Americans have not received the level of help from the federal government that they need to rebuild their communities. Far too many Puerto Ricans are still with electricity and lack access to food and clean water. Americans have always come together to help one another in times of crisis, and this should be no different. We must commit to supporting a full recovery for our neighbors." Congresswoman Nydia M. Velázquez said, "Puerto Ricans are American citizens and we cannot rest until the island is made whole. Governor Cuomo has shown great leadership in helping marshal both public and private New York resources to aid the recovery. Now, we need the full force of the federal government to be brought to bear by approving a comprehensive recovery and relief package that will rebuild Puerto Rico to withstand future disasters." Congressman Gregory W. Meeks said, "After this administration's disastrous attempt at hurricane recovery efforts for our fellow citizens in Puerto Rico, it's time to finally pick up the pieces and rebuild a stronger, better island for all Puerto Ricans. The recent report conducted by New York officials shed a spotlight on what so many Puerto Ricans and their families already know: Maria's damage is extensive. Governor Cuomo, my New York congressional colleagues, and I call on the federal government to fund an expansive and thorough rebuilding plan for Puerto Rico. It's time our fellow Americans finally received the support they deserve from their government." Congressman Joe Crowley said, "Our fellow Americans in Puerto Rico continue to suffer from the devastation caused by Hurricane Maria. While progress has been made, recent reports have made it clear that the federal government and Congress must do much more to ensure that everyone living there has the resources and assistance needed to rebuild their homes, economy, and communities." Congressman Brian Higgins said, "The road to recovery will be long for Americans in Puerto Rico and this critical support is necessary to help communities get back on their feet." Congressman Paul Tonko said, "More than three months have passed since hurricanes Maria and Irma slammed into Puerto Rico and many of our fellow citizens there still do not have access to safe drinking water, electricity or food security. I am proud of the many New Yorkers who have gone down to serve and support the rebuilding effort, including more than 1,000 members of the New York National Guard and many of our region's healthcare, utility and nonprofit workers. Our focus needs to be supporting them and the many others who are on the ground working to rebuild Puerto Rico for the future. Congress and the President should follow New York's lead and deliver the support our fellow citizens in Puerto Rico need and deserve." Congressman Sean Patrick Maloney said, "We New Yorkers lived through Sandy and Irene - we know how important it is for Americans to act like a family - when someone in your family suffers a tragedy, you pitch in to help out. We've put some money down to help along the way, but we can't let up - we need to provide more assistance to help our fellow Americans in Puerto Rico get back on their feet." Congresswoman Grace Meng said, "Nearly three months after Hurricane Maria wreaked havoc on Puerto Rico, the island continues to struggle with efforts to recover and rebuild. Since the storm hit, I have called for additional resources to be made available to Puerto Rico, and as a member of the House Appropriations Committee, I will continue to the fight until all the residents of Puerto Rico receive the help they need and deserve. We cannot forget or ignore the needs of our fellow Americans." Congressman Adriano Espaillat said, "Puerto Rico will rebuild and New Yorkers will continue to be there every step along the way. Today's announcement furthers our commitment in supporting Puerto Rico as it rebuilds critical infrastructure, housing and public buildings necessary to get back on track. I am proud to stand with Governors Cuomo and Rosselló, my fellow government officials, and our brothers and sisters in Puerto Rico to help repair and rebuild during this critical time." 100 Percent Federal Matching Payments: Raise the statutory 55 percent federal matching rate for Puerto Rico's Medicaid program to 100 percent for 24 months. Maintain Current Funding Levels: After the 24-month 100 percent match, Congress must continue current levels of funding for Puerto Rico's Medicaid program, consistent with the federal government's FY 2018 Budget request level of nearly $1.6 billion for at least three years. Eliminate the wrap-around payment requirement for federally qualified health centers, which current cost Puerto Rico $120 million per year. Congress is also debating expanding the powers of the financial oversight board created by the PROMESA Act. Expanding the authority of the Board would not only lead to government dysfunction, but it would also slow the recovery effort and it would take away the voice of the people of Puerto Rico and give it to an unelected body. The government of Puerto Rico must lead the recovery as the elected representatives of the voters of Puerto Rico. To spearhead the recovery effort on the ground, Governor Rosselló issued an Executive Order to create the Central Recovery and Reconstruction Office as a division of the P3 Authority. The CRRO will lead short, medium and long term strategic plans for recovery, develop a resource allocation plan and coordinate development of local and regional plans. The CRRO will be critical to executing the recovery priorities as outlined in the Building Back Better Assessment Report. In addition, New York continues to help Puerto Rico define the true scope of short and long term damage on the ground to secure critical federal funding with a detailed report on the island's power grid. The Puerto Rico Energy Resiliency Working Group completed its assessment and developed an affordable and sustainable blueprint for reconstruction of Puerto Rico's power grid. More information is available here.